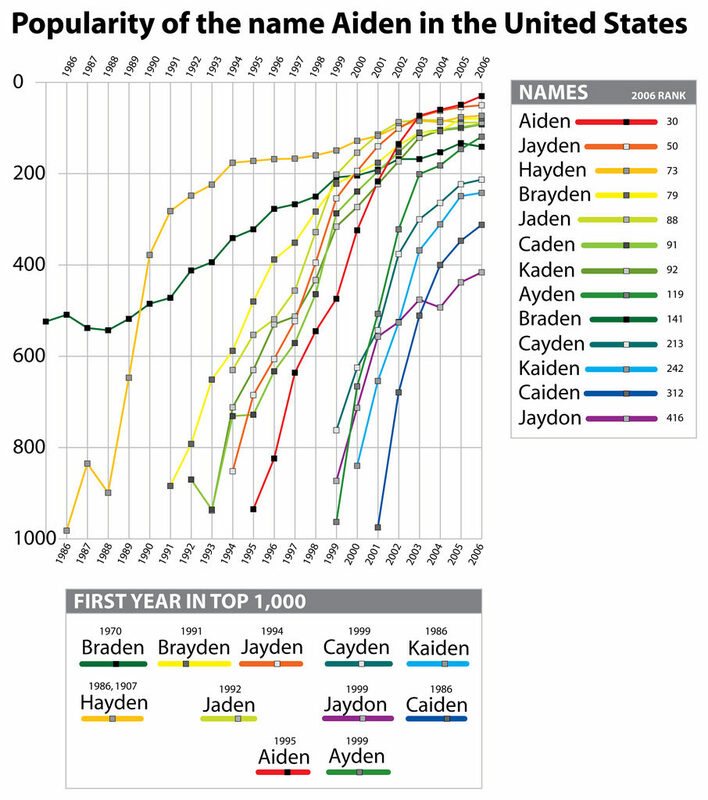 In the top 1000 baby names for 2006 there are twelve name variations based on Aiden: Jayden, Hayden, Brayden, Jaden, Caden, Kaden, Ayden, Braden, Cayden, Kaiden, Caiden, Jaydon. Hayden the originator: The first name to appear in the top 1000 was Hayden, so you could say that all these variations are based on Hayden. Braden the revivalist: By the mid-1980s, Braden was more popular and started the ressurgance of the name within the past 30 years. Aiden the ruling king: Right now the most popular variation is Aiden leading the pack overall by being the 30th most popular name in 2006. It’s weird how Aiden came out of nowhere in 1995 to become the leader. Personally, I just get them all confused. It’s been nine years since we looked at the popularity of these names. How do they rank now? Has the rhyming with Aiden worn out? 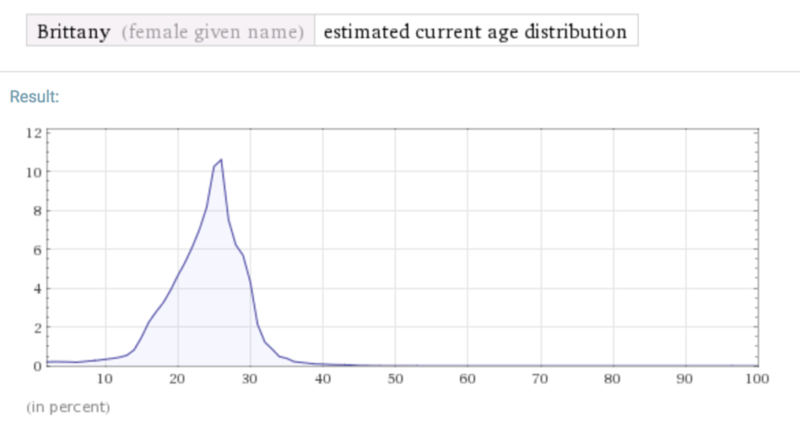 The red line is for 2006 when I last pulled the name data. All Aiden-like names are on the decline. Their peak was around 2010-2012. 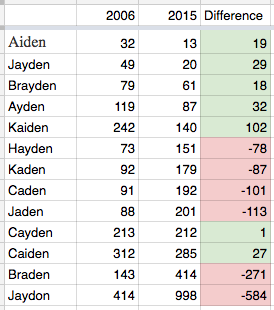 The secondary Aiden-like names of Hayden, Kaden, Caden, Jaden, and Cayden all peaked mostly in 2006 and 2007. It may be tempting to name your child with the popular name of Aiden, ranked 13th in 2015. Or even Jayden at 20th, but these are quickly becoming dated names. If you have a name that rhymes with Aiden, mostly like you were born between 2004 to 2010. 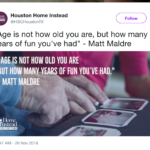 Thirty years from now, people will be able to know how old you are. Just like Brittany. If you know a Brittany, chances are, she was born around 1989. Most Brittanys today are in their mid-20s. If you know an Aiden, he’s most like to be about 5 years old. I think there was a section in Freaknomics that explained how certain names came to be dominance over time. Might want to look into that. You built this chart yourself, right, spudart? Yes. 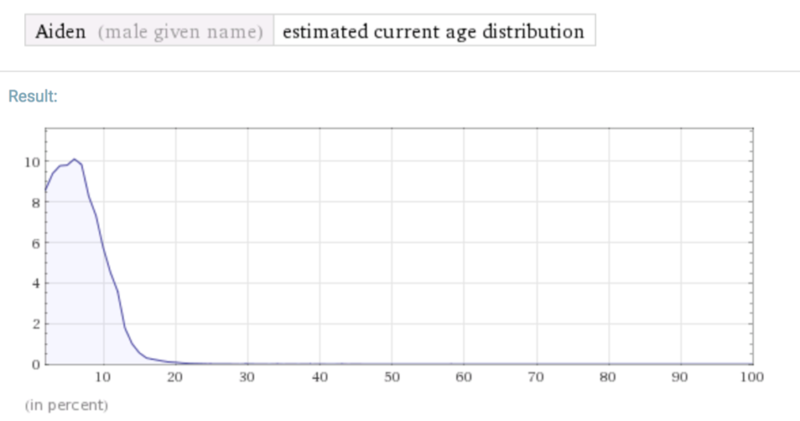 I built this chart with data from the Social Security Administration website at: http://www.ssa.gov/OACT/babynames/ I copied data from their site and put it into an excel document. Then imported that into Adobe Illustrator. 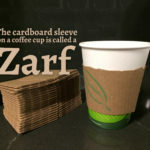 I wonder when this collection of names will begin to drop downward in popularity? 2009? 2010? or beyond? Nine years later, and I updated this blog post! 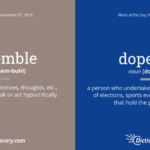 Moose– That’s a great idea. I’ve added an event to my google calendar saying to check the popularity of these names on Feb 8, 2010.